Two albums credited for fusing the politics of black liberation with the sound of freedom are Sonny Rollins’s Freedom Suite—the first experiment in 1958—and We Insist! Max Roach’s Freedom Now Suite— the fulfillment of the form. Born for the record in rural North Carolina on January 10 (by his family’s recollection it was the 8th) 1924, and raised in Bedford-Stuyvesant, Brooklyn, Roach was not only an innovative drummer who revolutionized jazz rhythms, he was actively engaged as a civil rights advocate and performed frequently for the cause. 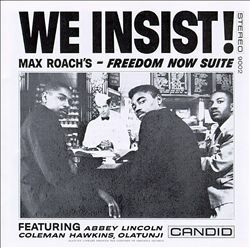 His Freedom Now Suite was initially conceived as a performance piece to coincide with the fast-approaching centennial of the Emancipation Proclamation in 1963: Fifty years later, as the historic document that freed all slaves celebrates its 150th anniversary, Roach’s piece with vocals by his then-wife Abbey Lincoln, (with Coleman Hawkins on sax, Olatunji on congas and lyrics by Oscar Brown Jr.) sounds as radical as the ’60s revolution in words and sound it helped to launch. The cover art, in bold black and white, was groundbreaking graphic and image-wise in its depiction of three African American men at a lunch counter, a white waiter standing by, a reference of course to the sit-in on February 1, 1960 at a Greensboro, North Carolina Woolworth’s store that became a pivotal action in the non-violent fight for civil rights. But inside the cardboard sleeve, the vinyl grooves were an assault on the senses, capturing as they did the sound of exploitation, degradation, and ultimately, freedom. A sonically and politically strong statement, the Freedom Now Suite is a cornerstone recording in the history of contemporary black liberation music and remains a challenging, invigorating, and inspiring listen for anyone interested in such things. Making a link between the oppression of blacks throughout the world, Roach and other politically motivated American artists like Harry Belafonte and Nina Simone sought to parallel the civil rights movement in the US with the unfolding liberation of Kenya, Ghana, Congo, and Algeria. Dubbed the Year of Africa, 1960 held hope for the continent for independence from France, Britain, and Belgium and the promise that human rights, dignity, and economic health would be restored throughout the land. Fifty-three years later, the people here and there continue the fight for human rights, and the chance to be emancipated from the conditions of poverty, ill-health, environmental crisis, and violence that defines both our lands, while Freedom Now Suite still pounds out the sound of impending liberation. The following clip depicts civil rights power couple Max Roach and Abbey Lincoln with their band performing the suite’s “Triptych (Prayer/Protest/Peace)” on Belgian television in 1964. Roach passed in 2007, though in his lifetime he he’d been a recipient of the USA’s MacArthur genius award, a commandeur in France’s Ordre des Artes et les Lettres, and a RIAA (Grammy) honoree. Read more on both Rollins, Roach, and their respective Freedom Suites in Keep on Pushing.